A membership in PFLAG helps us extend a helping hand to families who have gay members; provides educational material for families and the public; brings interesting and timely articles about gay issues; and offers a family voice that stands for equality and justice for all human beings. You can join at any time of the year. The current membership year extends from October 1, 2018 to September 30, 2019. Local membership includes the local PFLAG newsletter and you can even opt to receive it via email. Please send this form with your check. All information will remain confidential. Membership and contributions are tax deductible. 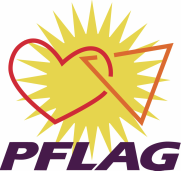 PFLAG is a 501(C) 3 nonprofit organization.